There are many people who suggest that fashion runway shows are a waste of time. They take a lot of hours and money to plan but result in a twelve minute show. Every time I attend an Oscar de la Renta fashion show, I am reminded of the magic that happens when you see the fashions come down the runway in person. They are an important event for the editors and buyers because you can't see in photos the movement of the dresses or the way the light hits the beading and embroidery. 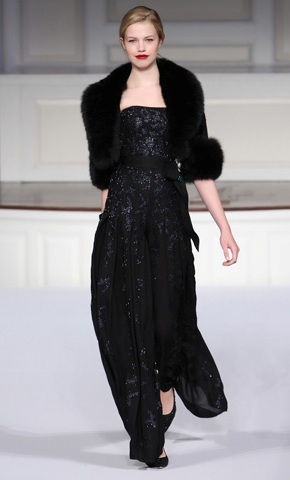 These photos of just some of my favorites from the Oscar de la Renta Pre-Fall 2011 show don't really do the gorgeous outfits justice but they give you an idea of just some of the magic I saw yesterday. Pre-fall collections as well as resort usually stay a little under the radar and always offer options that you don't see over played in every magazine. It's too bad we'll have to wait for them though, I saw some fabulous options for the holidays!